With more than 30,000 runners and 100,000 spectators expected to attend Sunday’s Rock ‘n’ Roll Marathon and Half Marathon, the Metropolitan Transit System is encouraging attendees to take the Trolley to avoid traffic congestion and use the Compass Cloud mobile ticketing app to purchase fares. To avoid Trolley ticket lines and speed up the boarding process, runners and spectators can purchase and store Trolley passes on their smart phones at any time prior to arriving at transit stations by using Compass Cloud, MTS’s free mobile ticketing app. Fans can find the app by search for “Compass Cloud” in the App Store or on Google Play. New RnR Shuttle Service! The Rock ‘n’ Roll Marathon is offering pre-paid shuttle bus service from the County Center/Little Italy station to the start line. Runners’ best option is to pre-purchase a shuttle ticket at the RnR Expo and pre-purchase an MTS Day Pass on Compass Cloud, and take the Green Line to County Center/Little Italy. The Start Line Shuttle ticket is NOT valid on MTS services. 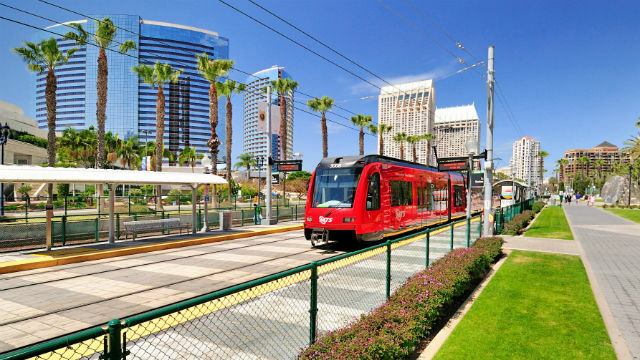 Early Bird Special – Extra early and high frequency Trolley trips are scheduled on the Green Line from Qualcomm Stadium (with stops in Mission Valley, Fashion Valley, Old Town and more) to County Center/Little Italy Station. The start line is 1.3 miles walking distance from this station. Spectate Like a Pro! The best viewing locations for the full marathon are along the Trolley’s Green Line at Old Town, Morena/Linda Vista and Fashion Valley. Spectators can watch their runner then hop on a Trolley and beat them to the finish line! MTS operates 95 bus routes and three Trolley lines on 53 miles of double-tracked railway. Every weekday more than 300,000 passenger trips are taken on MTS bus and Trolley services in 10 cities and unincorporated areas of the county. In FY 2016, MTS served 92.6 million riders. For more information on how you can use public transportation and save money, go to www.sdmts.com.